I've written two posts (here and here) about the ROK being taken to the CERD accused of racial discrimination over HIV testing of foreign English teachers. 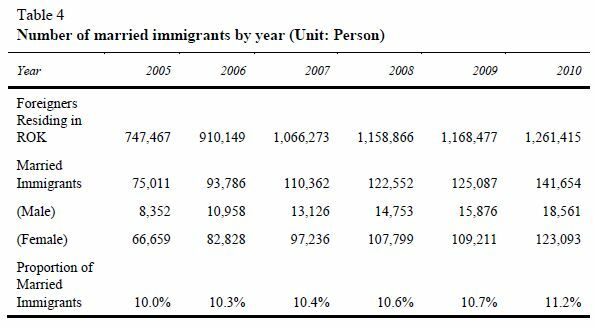 The total number of naturalized citizens during the eleven years from 2000 to 2010 amounts to 98,329, which is 0.19 per cent of the 50,515,666 registered citizens. [...] Chinese immigrants take up the majority of naturalized Korean citizens, followed by those from Vietnam and the Philippines. The number of naturalized citizens from Vietnam outnumbered that from the Philippines in 2007. 16,312 persons were naturalized in the year 2010 alone, and among them 11,874 were Chinese (72.8 per cent), 2,997 were Vietnamese (18.4 per cent), 450 were Filipinos (2.8 per cent), 181 were Mongolians (1.1 per cent), and 68 were Pakistanis (0.4 per cent). 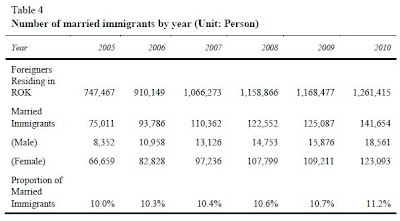 The number of married immigrants (foreigners who married a Korean citizen) is consistently increasing every year. As of December 2010, 141,654 married immigrants are residing in the country: 18,561(13.1 per cent) are males and 123,093 (86.9 per cent) are females. By nationality, there are 66,687 Chinese (including 31,664 ethnic Koreans, 47.1 per cent), 35,355 Vietnamese (25.0 per cent), 10,451 Japanese (7.4 per cent), 7,476 Filipinos (5.3 per cent), 4,195 Cambodians (3.0 per cent), 2,533 Thais (1.8 per cent), and 2,421 Mongolians (1.7 per cent). As of 1 May 2011, there are 151,154 children of foreign residents residing in the Republic of Korea. Among them, there are 93,537 (61.9 per cent) children under the age of six (children not attending school) and 37,590 (24.9 per cent) between the ages of 7-12 (children attending elementary school), which accounts for 86.8 per cent of the total foreign residents‟ children in Korea. As of 1 May 2011, 76,985 (50.9 per cent) of the foreign residents‟ children are male and 74,169 (49.1 per cent) are female. 9,621 children (6.4 per cent) have two foreign parents, 126,317 (83.6 per cent) children have one foreign parent, and 15,216 (10.1 per cent) children have parents who are naturalized citizens. For more on the early years of accepting refugees, here's a post I wrote in 2005. Now, submitting the report these statistics are taken from was only one step in a process states who are party to the Convention on the Elimination of All Forms of Racial Discrimination undergo. For the next step, on August 22 a delegation from the Republic of Korea presented the report to the Committee on the Elimination of Racial Discrimination, who then asked questions about the report regarding how the ROK is implementing the provisions of the Convention. The ROK then had a chance to answer some of the (many) questions which were asked. I understand also that there has been a lifting or a proposed lifting of the requirement of mandatory HIV testing for all foreigners, and I would be interested to know something about this – which foreigners does it apply to, why, from where, and in which circumstances? The ROK chose not to provide an answer to this, which is interesting, considering that the ROK has a complaint pending on that very topic before the Committee. Some visa categories, notably ‘E-2 Teaching Foreign Languages’ ask applicants for their HIV status, and there have been reports of foreigners being deported because of their HIV status. Does the ROK Government consider this to be discrimination and, if so, what measures will it take to address this issue? No answer was given to this question, however. As for the CERD meeting of two weeks ago, this was but one of many topics that were brought up, and there are lots of interesting questions asked. A summary of them can be found here, while video of the nearly six hour meeting can be watched and downloaded here. It appears that S. Korea will just ignore the CERD. Why would they respond when they don't know how without looking or sounding stupid? I doubt they ever responded to the U.N. General, they're very own Ban, Ki-moon when he suggested they stop discriminating against native English teachers(requiring HIV/AIDS tests) so nobody really expects them to respond to anyone else connected with the U.N.do they? From the CERD meeting summary "Today’s conversation would be concerned with ‘rights realization’, in particular with regard to the Convention, as a basic for a peaceful and successful society. The State party’s enactment of the Refugee Act, which would come into force in 2013, was noted, as were new employment legislation for migrants, although the visa system was often very confusing." I don't think anyone from Korea Immigration Service or elsewhere could explain Korea's visa system? to be fair, if you watch that video there was a huge number of questions asked (like 20 minutes worth), and i'm sure this wasn't the only one that wasn't answered. i had no idea that the u.n. was that thorough in it's analysis of whether or not countries have followed the CERD guidelines, or that it had meetings like this in the first place. given everything that the government has to work on, i can sort of understand them not paying too much attention to HIV testing. i think resolving the issue of stateless children, for example, deserves a lot more attention than whether we foreign teachers are offended by a policy or not.